Submitted by Gina Asprocolas on Wed, 09/13/2017 - 09:50. NEW YORK – September 13, 2017 – The Scholastic Art & Writing Awards, the nation’s longest-running and most prestigious scholarship and recognition initiative for creative teens, is now accepting submissions from students across the country in grades 7–12. The Awards have fostered creativity and talent since 1923 for millions of students and feature a notable list of alumni including: Andy Warhol, Truman Capote, Richard Avedon, Sylvia Plath, Charles White, Kay WalkingStick, Ken Burns, John Baldessari, Mozelle Thompson, Joyce Carol Oates, Hughie Lee-Smith, Robert Redford, Zac Posen, and Lena Dunham. 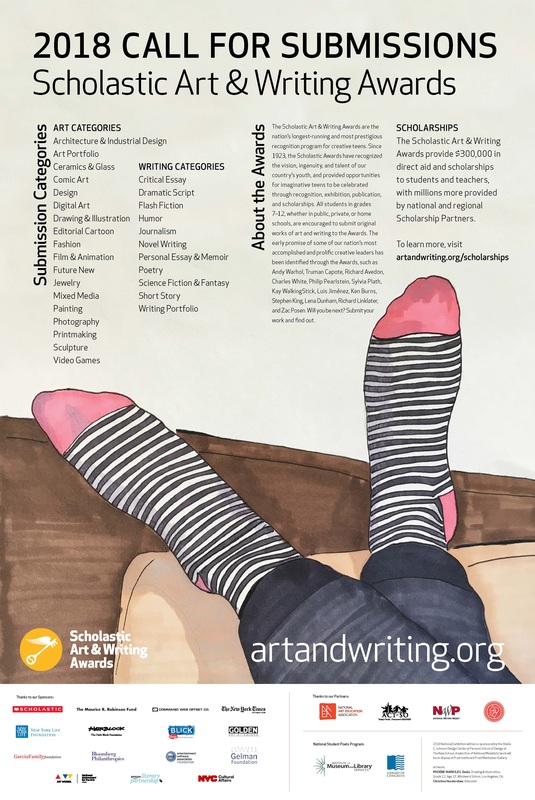 To learn more about submission details for the 2018 Scholastic Art & Writing Awards, visit artandwriting.org. Gold Medal Portfolio is the program’s highest national honor, which awards 16 high school seniors a $10,000 scholarship for their writing or artwork portfolio. The New York Life Award sponsored by the New York Life Foundation recognizes teens exploring issues of grief and bereavement in their creative work and providing six young artists and writers with $1,000 scholarships. The Herblock Award for Editorial Cartoon sponsored by The Herb Block Foundation provides three young artists with $1,000 scholarships for their outstanding editorial cartoons. The Civic Expression Award in partnership with the Campaign for the Civic Mission of Schools and sponsored by the Maurice R. Robinson Fund provides $1,000 scholarships to six students whose art or writing promotes responsible civic life. Students in grades 7–12 in the U.S. and its territories, as well as American schools abroad, are invited to submit creative and original work in any of the Awards’ 29 art and writing categories, including architecture, painting, flash fiction, poetry, printmaking, and video game design. All works are evaluated through blind adjudication first on a regional level by more than 100 local affiliates of the Alliance and then nationally by an impressive panel of creative industry experts. This past year’s group of distinguished jurors included cartoonist Leela Corman; writers John Corey Whaley, Edwidge Danticat, and Baratunde Thurston; artist Dread Scott; and curator and art critic Hrag Vartanian. At each level of judging, all works are reviewed based on the same criteria that have represented the program since its founding in 1923: originality, technical skill, and emergence of personal vision or voice. More information is available at artandwriting.org/guidelines. Winter 2017: Deadlines vary by region and are followed by local announcements of Gold Key, Silver Key and Honorable Mention recipients as well as American Visions & Voices Nominations. These students and their teachers are honored locally through community ceremonies and exhibitions. All Gold Key recipients are forwarded for the next round of national awards and honors. March 2018: National Recipients and Special Awards are announced. June 2018: National Gold Medal Portfolios, Gold Medalists and Silver Medal Portfolios with Distinction are honored at Carnegie Hall with their families and educators. Last year’s ceremony included special appearances by Paul Chan, Ellie Kemper, Hunter March, Amy Schumer, and Allison Williams. Summer 2018: Select 2018 National Medalists’ works will be highlighted in the Art.Write.Now.Tour – a traveling public exhibition displaying teen-produced art and writing. Writing recipients may have their work published in The Best Teen Writing of 2018, an anthology showcasing stories, essays, and poetry of teen authors. The 2017 edition is currently available at artandwriting.org/publications and on Amazon.com. For 95 years, the Awards, presented by the nonprofit Alliance for Young Artists & Writers, have identified the early promise of some of our nation’s most accomplished visionaries and encouraged young artists and writers to pursue a variety of creative career paths and endeavors. In the 2017 program year, a record-breaking 330,000 works were submitted for adjudication at the regional level, with more than 2,700 public, private, and home-schooled students receiving national recognition. Each year, exhibition, publication, and scholarship opportunities are made available to students honored through the program for their creative work in 29 categories, with opportunities expanding each year. For more information about the Alliance for Young Artists & Writers and the Scholastic Art & Writing Awards, visit the Scholastic News Room: mediaroom.scholastic.com/artandwriting. The Alliance of Young Artists & Writers is grateful to our generous sponsors, who provide funds to support and produce all our programs, including the Scholastic Art & Writing Awards, the Art.Write.Now.Tour, Scholastic Awards Summer Scholarships, Workshops, and more: Scholastic Inc., The Maurice R. Robinson Fund, Command Web Offset Co., The New York Times, New York Life Foundation, The Herb Block Foundation, Blick Art Materials & Utrecht Art Supplies, Golden Artist Colors, Garcia Family Foundation, Bloomberg Philanthropies, ESA Foundation, The Jacques and Natasha Gelman Foundation, National Endowment for the Arts, New York City Department of Cultural Affairs, Amazon Literary Partnership, Institute of Museum and Library Services, Poetry Foundation, and numerous other individual, foundation, and corporate funders. Click the image below to open a hi-res version in a new window.